Wine Tour in Oregon – Time to Return? Parts of my visit to the Willamette Valley in Oregon 19 years ago are still really clear in my mind, a humble private wine tour that I still treasure. There’s something about travel to certain wine regions – the impression of the wines from that place you’ve been to are changed for ever. Almost inevitably for a first wine trip from Europe to the USA, we had spent a couple of weeks in California already and then had taken the wonderful coastal drive north and into Oregon. There didn’t seem to be any motels or even small hotels in the wine area, so we had booked – a first for us – a homely Bed and Breakfast to stay in for our three nights there (In those days, for the British, B&Bs had terrible connotations – cheap and rarely cheerful, shabby, cramped with shared bathrooms and greasy breakfasts). Somewhere near Newberg, our little Oregon B&B was far removed from this – sadly I’ve forgotten the name – but I do remember the so-called ‘Victorian’ furniture (“genuine antiques” our motherly hostess explained) and I remember the most amazing breakfasts that included pancakes with different fresh fruit each day that Mrs B&B had gone out early to pick – it was June. I had made a few appointments with wineries through contacts in the UK and others were still to make, but there were really only about 20 serious players way back then. My first lesson was from David Adelsheim who welcomed us to Oregon, explaining that even if we thought we’d just been to California in fact we had come up from Baja Oregon … and then said something I used in wine classes for ever afterwards: “By the way, it’s pronounced Wil-lam-ette, damn-ette”. He also helped me (but not with much success) to get an appointment with the late, much-lamented David Lett of Eyrie Vineyards, who everyone said we simply must visit. Every time I phoned for an appointment, David Lett would state that he worked on 10-minute time slots and couldn’t commit to seeing us, but we should phone again. Eventually I phoned from a call box (no cell/mobile phones in those days) in the McMinnville shopping mall and he said to come right along. The man was memorable, the wines too of course, and the winery, in an old turkey-pressing plant in the town, where it still is today, was memorable for all the sayings on the wall – “Just say no to Cabernet” was the one that sticks in my mind because it was so apt at the time. Oregon is calling me to return, especially since I tasted some excellent Pinots at the annual Pacific North-West tasting in London last week. I took the chance to discuss wine tourism with a couple of winery representatives. Michael Davies of A to Z Wine Negoçiants explained to me how Oregon wine tourism has really developed in the past decade and that previously there was little awareness of its potential. Now wineries are working together with great restaurants (though there are no winery restaurants yet) and there is plenty of accommodation close to the vineyards. The big plus about visiting Oregon’s wineries is its accessibility – the vast majority are owner operated and even a casual visitor has a fair chance of meeting the winemaker, the vineyard manager or the owner. Some wineries do need an appointment to visit, but you can find this out and plan your tour with some great on-line resources from the Oregon Wine Board’s website. Howard Rossbach, president of Firesteed Cellars, who’s exported to the UK for nearly a decade, emphasizes the fact that Oregon is a very diverse food-producing region, and on a visit there you can enjoy a vast array of fruits and great seafood. The proximity of the wine regions to the spectacular Pacific coast on one side and the beautiful, forested Cascade Mountains on the other is another draw. You can take a week or two in Oregon combining a wine tour with anything from visits to the towns of Portland and Salem to exploring the natural wonders of the coast, the Cascades, the volcanoes or Crater Lake. Depending on the season, sporting activities vary from skiing to white-water rafting all within easy reach. At the London tasting I was privileged to attend a seminar and tasting given by Burgundy and Oregon producer Véronique Drouhin, whose father Robert Drouhin was inspired by those early pioneers Lett, Adelsheim and others to establish a vineyard and winery in the rolling Dundee Hills of the Willamette Valley. When I visited all those years back, the landscape struck me as being visually a cross between Alsace and Burgundy – it was very green compared to California. In 1990 the Domaine Drouhin winery had just been built and we were able to tour the half-empty building with the then manager Bill Hatcher, now a key figure in the Oregon wine world. We tasted the already acclaimed first vintages and were duly impressed, as I was again tasting the wines paired with their Burgundy equivalents last week. Today, Domaine Drouhin is opened to casual visitors Wednesday to Sunday 11am-4pm with a modest $10 charge for tasting four wines (including one from Burgundy), refundable on purchase. You can also schedule a more in-depth tour. As I said, Oregon is calling me to return. 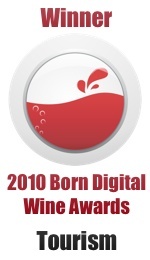 This entry was posted on Tuesday, January 27th, 2009 at 3:31 pm and is filed under Wine Tourism General. You can follow any responses to this entry through the RSS 2.0 feed. Both comments and pings are currently closed. 3 Responses to Wine Tour in Oregon – Time to Return? Interesting read. Oregon was very nearly my home once. I too would like to do a winetour there. Met a man at Terra Madre Torino who makes cheese and other organic treats there. Maybe one of these days. Thanks for the virtual tour. Don’t forget to visit the wineries around Eugene. King Estate and Pfeiffer Vineyards are just 2 of several local wineries that are really worth seeing. Sunshine Limo Service and Wine Tours is a good local tour operator if you’d like to do a guided tour and don’t want to worry about driving. The Lane County wineries are good optio to visit if you’d like a change of pace from the busier, more commercial Dundee area wineries. Enjoy!